LONDON, UNITED KINGDOM, February 6, 2019 /EINPresswire.com/ -- As armoured vehicles are required to operate across diverse environments and against varying enemy forces, they need to be able to deliver the firepower required to eliminate these adversaries. 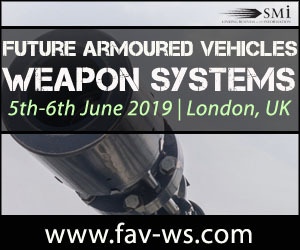 For this reason, SMi Group are delighted to present Future Armoured Vehicles Weapon Systems (FAVWS)1 conference, taking place on the 5th-6th June 2019 in London. FAVWS 20192 will bring together, not only senior military personnel to network, but also leading technical directors and engineers from industry and senior military experts to update attendees on the latest developments in armoured vehicle weapon systems and fire power. There is an Early Bird saving of £4003 expiring at midnight on Thursday 28th February 2019.